Expect another night of dutty tropical riddims and low slung basslines to have you down low on the dancefloor. No other night has you twerkin’ it like this. Presented by Sydney’s modest champions of reggae, dancehall and bashment Nick Toth, Basslines, Shantan Wantan Ichiban and Mike Who. 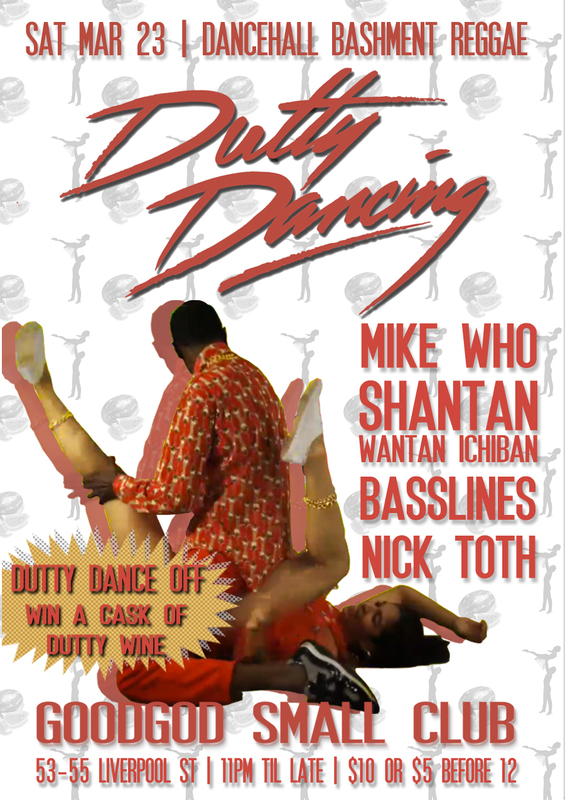 Plus… DUTTY DANCE OFF RETURNS! Win one of our finest cask of DUTTY WINE from the vineyards of Jamaica in our controversial dancehall dance off. Start practicing now, working on your routine – and you could win fame and glory and a cheap goonbag as our DUTTY DANCEHALL QUEEN. This entry was posted in Events and tagged australia, bashment, basslines, dancehall, dutty dancing, goodgod small club, mike who, nick toth, reggae, shantan wantan ichiban, sydney. Bookmark the permalink.